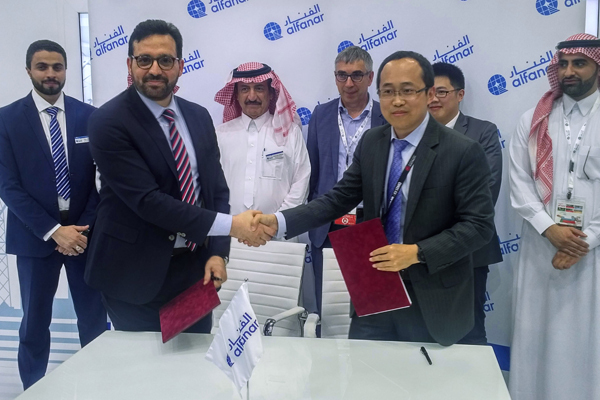 Saudi-based alfanar, a leading manufacturer of wide range of electrical products and solutions in the Middle East, has partnered with Huawei to explore how IoT and 5G technologies can be used to bring greater sustainability, efficiency and cost-savings to its electrical products. Together, the two companies will co-create 5G and IoT solutions that will accelerate the digital transformation of the Middle East’s electricity industry, said a statement from alfanar. An agreement was signed during the Middle East Electricity trade exhibition held recently in Dubai. Through this agreement, alfanar and Huawei will adapt Huawei’s global IoT cloud service to the unique requirements of the Middle East and launch the service in the Saudi Arabia for the first time, with the goal of expanding the service to the rest of the region soon. This service will help organizations in Saudi Arabia to become more sustainable by developing energy management solutions that enable customers to precisely track and monitor their energy consumption, it stated. The MoU has already led to successful integration of NB-IoT chips into alfanar’s products, such as the smart energy monitoring NB-IoT devices. The sensor data is then decoded by alfanar, and the network-specific KPIs are made available to provide added values to end-users via Huawei IoT platform, said the statement from alfanar. Innovations such as these will make life more convenient for the people of Saudi Arabia, and have a key role to play in making the Kingdom greener and more energy-efficient, helping organizations reach the sustainability targets outlined in Saudi Vision 2030, it added. Chairman Abdul Salam Almutlaq said: "As one of the major players providing electricity infrastructure to Saudi Arabia, we are excited to partner with Huawei and harness the most advanced ICT technologies and integrate them with smart solutions." "Emerging IoT and 5G-driven solutions are finally allowing smart services to be deployed on a large scale, and we look forward to spearheading the shift towards building a smarter – and greener – kingdom," he added. Sun Xiaofeng, VP of Middle East Region, Head of Middle East Marketing and Solution Sales Department, at Huawei, said: "We are excited to launch this innovative cloud service here in Saudi Arabia, with the hope of soon expanding across the region and even the world." "We are committed to open innovation and collaboration to promote the power sector in Saudi Arabia; by working with our local partners to co-create tailored solutions, we aim to be the leading technology enabler in the Middle East," observed Xiaofeng.